﻿Ben Carroll was born in Bulgaria, in July of 1994. He was placed in an orphanage and basically neglected. When he was 18 months old, Ed and Laura-Lee Carroll took him into their hearts and into their home and the healing began. Love, prayers and nurturing became part of Ben’s daily life and by the grace of God his life began to change. Diagnosed with autism, Ben and his mom went to the Children’s Hospital twice a week for years for speech and occupational therapy while mom was also home schooling Ben. In the October 2-3, 2004 issue of the Journal Inquirer, Ben was featured on the cover and they gave a background of his life and told of his upcoming one-man art show. On October 16, 2004 Ben had his art show, which was called “Benny’s World” and many friends (including his teachers and doctors) and his family, came to the reception to view his work and to encourage him. Benny was beaming because he knew that this day was his and he was so proud of himself. Ben currently attends The Intensive Education Academy in West Hartford and is healing more and more each year. We hope Ben’s story will be an inspiration to everyone. Never give up...with love and prayers, anything is possible! 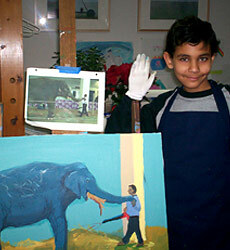 Ben started painting at age 9. He had his first one-man Art show at age 10 (Benny's World). Ben is the youngest member of the Manchester Art Association. Ben loves animals: Elephants are his favorite! He loves dogs, too. He loves his cats: Nicky and Reilly. Ben plays Baseball (Manchester Challengers) and Kickball. He swims at IOH at Manchester High School. Ben loves events: Circus and Carnivals, Father/Son Retreats, DJ Parties, Wolfpack and Rockcat games and Six Flags. He started a Friendship Club. 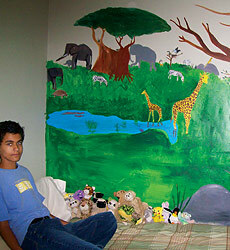 Painted a mural on his bedroom wall. He's been on TV and in newspapers and magazines. Ben loves cotton candy, snow cones and veggie pizza. 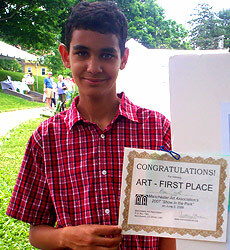 Ben's artwork was displayed at the West Hartford Art Walk, September 22 - October 15, 2005. His artwork was in the Toy Chest front window.